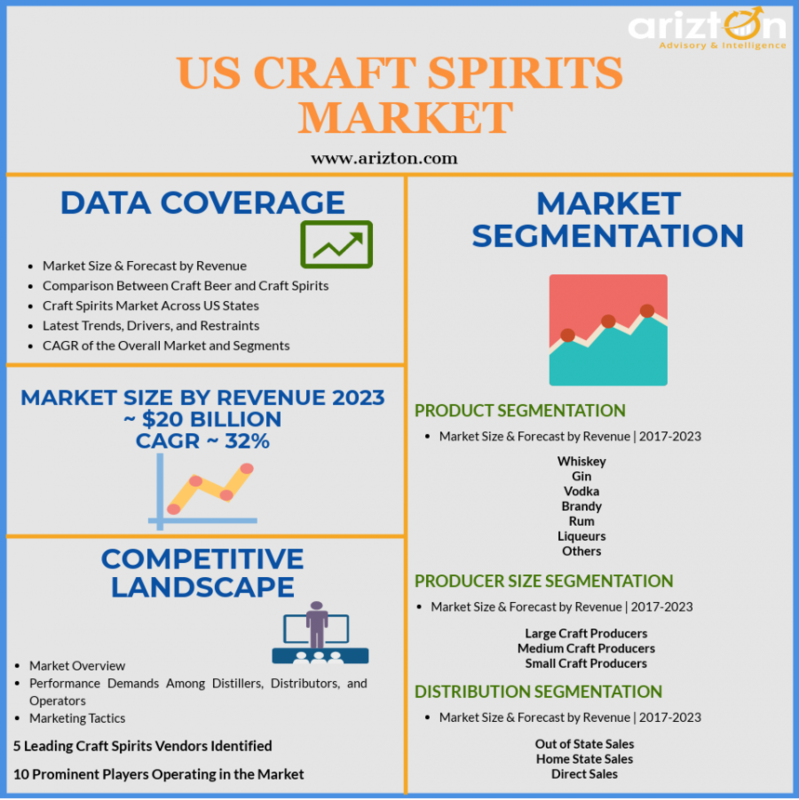 The US craft spirits market is expected to reach revenues of more than $20 billion by 2023, growing at an impressive CAGR of over 32% during 2018-2023. CHICAGO, IL, UNITED STATES, July 9, 2018 /EINPresswire.com/ -- Arizton’s recent market research report on the craft spirits market in US identifies Diageo, Pernod Ricard, Bacardi, St. George’s Spirits, and House Spirits Distillery as the leading vendors that are likely to dominate the market during the forecast period. 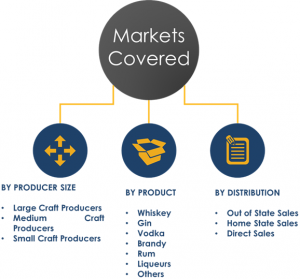 This research report provides detailed analysis of market segmentation by product (whiskey, gin, vodka, brandy, rum, liqueurs, and others), by product size (large craft producers, medium craft producers, and small craft producers), and by distribution (out of state sales, home state sales, and direct sales). The changes in taste and the growing demand for small batch, handmade beverages with unique flavor profiles is contributing to the growth of the US craft spirits market. The growing number of younger demographic is encouraging the market of these beverages in the US market. The growth of the economy is driving greater flexibility and giving consumers the luxury to demand handcrafted alcoholic beverages in the US market. The increasing in tourism and growing interest in visiting distilleries is encouraging manufacturers to invest in the development of new breweries in the US market. The rapid change in consumer palates, jaded existing products, ease in production, ease in regulations, and intensification of social drinking are some of the factors driving the growth of the US market. These factors will promote the demand for premium and artisanal craft beers with distinctive flavors in the US market over the next few years. The distilleries in the US market are adopting the incubator model of business which allows small brands to access corporate money, either through capital investments or by selling a majority stake while remaining in control of the trade. These business models will promote the growth of the market and result in the production of unique beverages in the US. The availability of best-selling gins, whiskeys, rums, and vodkas will also contribute to the revenues in the US craft spirits market. The focus on the mixing of handmade craftsmanship, tons of culture, and locavore ethics are resulting in the thriving craft brewing industry and distilling industries in the US market. The new trends of consuming and producing absinthe, liqueur, Amaro, and aquavit will add to the growing revenues in the US market. The US craft spirits market is expected to reach revenues of more than $20 billion by 2023, growing at an impressive CAGR of over 32% during 2018-2023. The report also includes market size in terms of volumes produced during the forecast period. Looking for more information, Request a Sample. The US craft spirits market is highly fragmented and is witnessing consolidation activities by large producers acquiring established craft distilleries. The leading players in the market control majority of the market share and competition in the US. The introduction of different product categories will help vendors sustain the competition in the US market. The increasing influx of women entrepreneurs in the industry that is bringing in whole new perspectives will result in the evolution of the US craft spirits market during the forecast period. The top companies in the US market are competing on the basis of accessibility, taste, variety, ingredients, quality, price, versatility, and flavor.